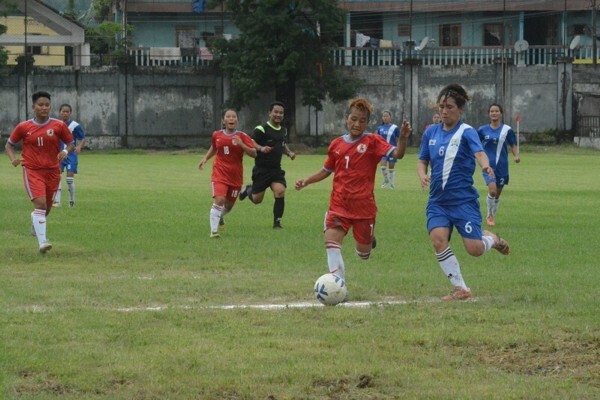 The on-going Arunachal Women’s League football tournament witnessed two interesting matches on Wednesday when Capital Complex FC (CCFC) and Arunachal Utd FC (AUFC) won their last group matches to seal their places in the semi-finals of the Arunachal Women’s League at the Rajiv Gandhi Stadium, in Naharlagun. In the first match, AUFC clinched victory over FC Doimukhby a solitary goal in a hard-fought match. Donic Poonam scored the all-important winning goal in the dead end of the second half. In the second match, CCFC thrashed debutant Kamle DFA by a humiliating margin of 13-0, with Techi Akung being the highest scorer with six goals. A hat-trick by Roshni Ramching, a brace by Tamchi Yapi and a goal from Techi Amin wrapped up the huge win for CCFC to qualify for the semi final as the group winner of pool A. Later on Thursday Arunachal SC is taking on Upper Subansiri DFA at 2 pm while Deed Circle FC take on All Hija Sports Association at 3:45 pm.